We took a trip to the Portland Farmer's Market this morning and came away with some great food finds. We bought some great pasta, heirloom tomatoes, and herbed goat cheese. 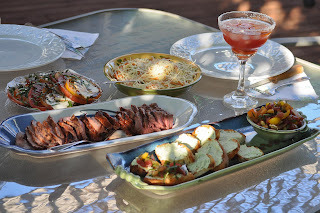 We used all these finds and for supper tonight, we had tri-tip marinaded in a garlic and herb marinade; caprese salad with heirloom tomatoes; pasta (blend of three kinds); and caprese with herbed goat cheese appetizer. Combine all ingredients in small bowl, stirring until sugar is dissolved. Marinade tri-tip all day or over night. Grill. For the caprese salad we used heirloom tomatos layered with fresh mozarella and sprinkled with fresh basil, olive oil and balsamic vinegar. The caprese appetizer was made with toasted herb bread spread with herbed goat cheese and topped with diced heirloom and fresh garden tomatoes, seasoned with balsamic vinegar and lemon oil. At the farmer's market we found someone who made fresh dried pasta. It was wonderful. Every bit as good as my homemade. She mentioned she was going out of business within the year because she was having a baby in six months. I asked if she would share her secrets and she did. I hope to try her techniques out and share them in later posts. I bought five packages from her as a thank-you for sharing her secrets. The pasta above was a mix of about 1/2 tomato pasta, 1/4 regular, and 1/4 basil pasta. I tossed the pasta with a little olive oil and sprinkled with grated Parmesan cheese. It was a great complement to the tri-tip. This was a wonderful, light refreshing summer meal.